The stark white trunks of the birch trees greet me with a sharp contrast to the cool dark shadows they cast along the alee that leads me down a moss covered path. I step out from under their cooling canopy and into the bright warm light. Sometimes, I find a mallard duck pair preening themselves or swimming around the small pond. If I startle them, they kick up a fuss, a warning to others of my presence. The pair easily lifts to the air with a quick beat of their wings and grumble loudly as they fly away. Lit by the sun, the pond sparkles in the afternoon light. If I could, I would spend a lot of time lurking here in the shade. The dancing light on the water is mesmerizing; it is a great way to relax in the moment. During the warm summer months, in the center of the brown-hued, earth pond, a water lily blooms. Its round leaves fan out and reach towards the edge of the pond, where spikes of wild reeds and low growing clover flourish. 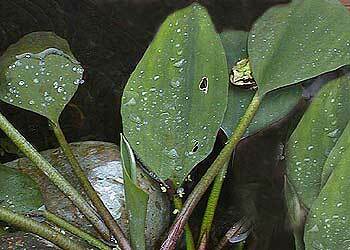 Today when I walked down to the lower garden, a small frog leaped from the camouflage of pond-side weeds and with a plunk, submerged himself into the safety of the murky water. Our mamas handed us bags to stuff the little critters into. “Bring some home for lunch.” Once they appointed us official hunters, we ran down the path that led to a bridge. We hurried across a small creek, skipped past the large red barn, and slowed down to walk through the tall, yellowed grass, ending up at a pond. The manmade pond had earth piled on one side like tall dikes. It stood above the rest of the landscape instead of gently sloping down to the water’s edge, as you would expect from a natural pond. A large weeping willow tree stood guard on one end, and saplings, tall wild grass and reeds grew along the rest of the banks. Approaching the water, we squealed in delight when we startled frogs, and they leaped towards the edge of the pond. In a race with the leapers, we had to move quickly, trying to catch them before they made it to the safety of the water. We moved around the perimeter of the pond, using our cunning to fool them into a false sense of safety. Most of the time, they tricked me into thinking I fooled them, leaping into the water just as I reached down. A small splash was all I heard as they quickly disappeared. Many frogs escaped, yet we caught plenty and shoved them into our bags. When we grew tired, we played along the pond’s edge until we heard our mamas call for us from the distant farmhouse. I was hungry by then, so we grabbed our bags and rushed back. Our mamas heated the black iron skillet when we returned. I don’t want to know how the live frogs in the bags became legs sizzling in the frying pan. Somewhere, I heard that frog legs jump around when placed in a hot skillet. To this day, I’m not sure if that, indeed, is what frog legs do. We played around the kitchen table while our mamas prepared lunch. As we ate the small legs, my friend smacked her lips and said, “It tastes like chicken!” We all agreed. When I go near my own small pond, the frogs leap for safety into the silted water, the same way they did during my hunting expedition many summers ago. Their final desperate leap to avoid capture is not necessary, as eating frog legs is not an experience I want to revisit. I built the pond for them and myself. My pleasure these days is sitting near the water, listening to the sound of amphibians calling out, in search of potential mates. My bliss is watching their legacy—tadpoles—bobbing up to the surface of the water, taking their first breaths of oxygen, then disappearing when they sink back down. Watching the blue-eyed darners and dragonflies darting above the water catching a mosquito lunch, as the tadpole goes through its metamorphosis in the safety of this refuge, is why I love this place. Once I have settled in quietly, the birds fly back to bathe and the ducks come to paddle around, eating the duckweed and small creatures that inhabit the water. While observing the wildlife, I try not to disturb them, and they trick me into believing I am invisible to them. However, one movement on my part, and they leap, run or fly to safety, reminding me of just how aware they are when I walk down the garden path to greet them, or watch them silently in the shadows.